Disclosure: This post may contain affiliate links that earn us a small commission at no additional cost to you. Our recommendations are thoroughly researched to only feature the best and most-loved products. Unlike humans, dogs can’t sweat to cool down. Coupled with a permanent fur coat, it may be difficult for dogs to stay cool on extra-hot summer days. Fortunately, there are a number of clever inventions to help dogs beat the heat. There are many pads on the market made with special cooling gel that maintains a lower temperature for hours, no refrigeration required. 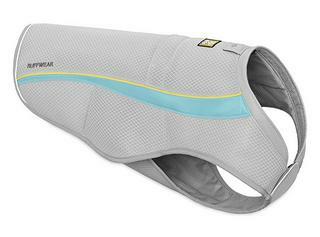 Better than the other side of the pillow, a cooling pad gives your dog a cool, comfortable place to rest and chill out. 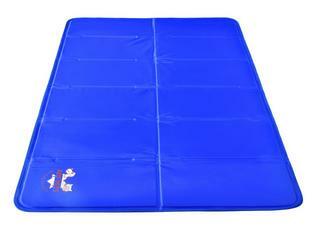 Hard plastic swimming pools made for children are also great for dogs who enjoy splashing around. 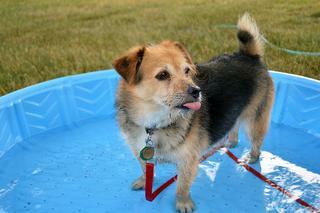 Kiddie pools come with a low price tag and can provide hours of fun for your pup. Find one at your local hardware store or big box stores. Dogs that spend a lot of time outdoors during summer face the risk of painful burns on their paw pads. Dog booties will protect your pup’s feet from hot sand, sidewalks, and concrete. Take it a step further than the cooling pad: a cooling vest wraps around your dog’s body and keeps them cool wherever they go. This stylish vest reflects heat and absorbs water to cool your dog with evaporative technology, similar to the cooling effect of human sweat. 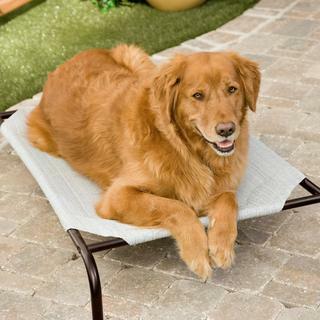 Made of breathable material, an elevated pet bed allows your dog to get airflow from all sides while they rest. Thick cushion beds are great during cold months but can retain too much heat for summer sleeping. The simplistic design of an elevated bed will help keep your dog cool on hot days. No matter how many ice cubes you add to your dog’s water dish, it seems to always reach room temperature in a matter of minutes on a hot day. Fortunately, there are bowls designed with a freezable component to keep your dog’s water cold for hours. The cold sensation from a popsicle or ice cream are sometimes just what we need to cool down in the summer heat. The Nylabone Romp ‘n Chomp Freezer Bone offers your dog the same relief, minus the sugar. In addition to these awesome gadgets, be sure your dog always has access to plenty of fresh water and a shady retreat to stay cool and healthy during the summer. Kiddie pool photo by flickr photographer eamathe.